CAPE CANAVERAL, Fla. -- There's an 80 percent chance the weather will be good enough for NASA to launch the space shuttle Endeavour Friday on its 25th and last mission to orbit. 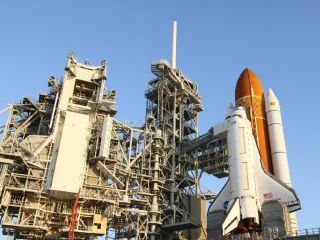 Endeavour is slated to lift off toward the International Space Station Friday (April 29) at 3:47 p.m. EDT (1947 GMT) from Kennedy Space Center (KSC) in Cape Canaveral, Fla.
"Overall our main concern for launch day is going to be crosswinds, and there's just a 20 percent chance of KSC weather prohibiting launch," shuttle weather officer Kathy Winters said during a press conference this morning (April 26). Endeavour's commander Mark Kelly and his five crewmates are expected to arrive at Kennedy Space Center this afternoon at around 12:15 p.m. EDT. "Mark Kelly and his crew are very excited to get here and they're ready for us to pick up our launch countdown," said NASA test director Jeremy Graeber. "Our preparations for launch countdown are all complete or currently in work and we're not working any issues at the moment." Friday's launch is expected to be a high-profile affair, with President Barack Obama set to watch in person from the seaside spaceport. Kelly's wife, wounded Arizona Congresswoman Gabrielle Giffords, will also be in attendance, according to news reports. Giffords was shot in the head in January during a mass shooting outside a Tucson, Ariz., grocery store. Kelly told CBS news on Monday (April 25) that his wife has recovered enough to come watch him lift off into space in person. "It is exciting to have the special guests," Graeber said. "I know the launch team worked very hard to make sure all of that excitement and those potential things that might be going on don't impact the launch team at all. 'We're yery aware of the fact that we've got a job to go do." Endeavour's mission is the second-to-last planned for NASA's three-orbiter shuttle fleet. The final mission will be the June 28 launch of space shuttle Atlantis to deliver more extra hardware to the International Space Station. Endeavour is promised to the California Science Center in Los Angeles, where it will be sent for public display after being processed following its mission. The 14-day STS-134 flight will include four complex spacewalks to install some of the new spare supplies and upgrade the space station. Astronauts will use the shuttle and station robotic arms to attach the astrophysics experiment, called the Alpha Magnetic Spectrometer (AMS), to the exterior of the station. AMS will hunt for exotic subatomic particles that could hold clues to some of the universe's secrets, including what makes up the mysterious dark matter thought to permeate space.